Building up trust in police is vitally important to both neighborhoods and entire cities. We firmly believe that both the community and the first responders must examine their attitudes and practices before mutual suspicion, lack of cooperation, and a downward spiral of lawlessness and violence can end in a community. Let's look for ways to practice sympathy and empathy. Trust in police is certainly not uniformly low. At the top of the article, we want to applaud the many communities that have avoided polarization and encourage them to keep doing what works. At the same time, we see that in almost every major city, many smaller cities, and in particular urban neighborhoods, the undertone of mistrust is strong. It reduces witness cooperation, which ultimately leads to more criminals and potential criminals out on the street. It makes police more jittery and therefore more prone to make a mistake. Similarly, suspects become more afraid and more likely to assault police. It contributes to neighborhood decline if a general feeling of disorder builds. We know that you are already aware of these factors, but we want you to think for a moment about how important it is that you address trust in police within your neighborhood and city. At the outset, we are calling upon city government elected and appointed officials, as well as heads of non-profit organizations and foundations, to lead the way in establishing an inclusive dialogue about this particular issue. Don't just let this issue sit under the radar until there's a big problem. That won't be the most productive time to have the conversation. It us imperative that a wide variety of stakeholders with different life experiences become involved. Include especially young people, since they often have the most negative perceptions about the police, particularly in minority neighborhoods. Be sure that elected officials are both present and mentally engaged in the process, as best you can. As the ultimate supervisors of the police department, they need to be well aware of the different facets of community opinion. Find those organizations and groups within the community that can bridge the gap because they have good relationships both with police and with community members who have been marginalized or who feel suspicious of the police. Let them take a leadership position in sponsoring the dialogue and identifying spokespeople. If necessary, reach out to experts such as psychologists who may have insights to contribute, but rarely participate in civic affairs. They can serve important behind-the-scenes roles. For example, it would be good to talk with such an expert about whether and how to address historic events. Since we don't shy away from telling you what we think on this website, we want to say at the top of this section that we don't think it is fair or truthful to blame the police for each and every instance of an innocent person being stopped, questioned, or even shot. We certainly don't want to do away with police departments as currently constituted either, although we must say that recently we have talked with several thoughtful people who can argue for that solution quite convincingly. We think there is hope that law enforcement can move beyond some of the behaviors that help to create and support the idea that neighbors can't trust the police. Yet there's no doubt that some police units really need to improve their practice. So here we offer two key areas where we think many urban police departments can improve in dealing with residents inside of neighborhoods. We aren't telling police leadership anything they aren't well aware of, but our goal is to inform residents about where they might focus in their activism about accountability. First and foremost, trust in police will be a by-product of their acting trustworthy. It's just like interpersonal relationships; if you act right, admit mistakes when you make them, and understand when another human being has a different life experience and set of perceptions from you, you will improve the relationship over time. And just like in personal relationships, if there is a serious breach of trust, it takes a long time and a series of positive interactions to repair it. Like in other human endeavors, someone who feels picked on will become more and more reactive when a behavior they find offensive is repeated. So it is a police responsibility to try very hard to avoid repetitive mistakes in judgment. They compound the problem of lack of trust in police. Body cameras and public security cameras may be necessary and appropriate for showing officers acting trustworthy, identifying problem police behavior, and helping residents build empathy with an officer who must try to peer into a potential perpetrator's mind and then decide in a split second whether his or her own life is in danger. Of course the cameras must be operational at all times, which has proven to be a challenge in some communities. Secondly, racial profiling creates so much negativity in the community that it's no wonder that often neighbors become reluctant to deal with the police. Unfortunately the children readily pick up on that vibe. The profiling eventually becomes a self-fulfilling prophecy. As more racial, ethnic, or other minorities are stopped, questioned, and searched, it's only natural that more drugs, guns, bootlegged movies, and so forth are found. Then some police feel even more justified in profiling. The issue of profiling is more difficult than many community folks can appreciate. We human beings judge one another on the basis of probabilities very often. Talking to community people for a minute, suppose you were in a store and heard that an early hip-hop vinyl record had been stolen. Cameras show that two people exited the store at the same time. One is an 80-year-old woman and the other is a 17-year-old male. Which one would you question first? Um, we thought you would make a generalization. Police are no different. Yet we have to ask them to be very careful that their hunches actually align with statistical probabilities. We also should expect and demand that all residents are treated respectfully and reasonably, regardless of their surface characteristics. We as residents also want minority community members, and indeed all community folks, to be treated proportionally to their misdeed. Jaywalking, non-functioning tail lights, or expired license plates shouldn't be occasions for a lengthy stop just because a person is black or brown; all residents should be treated the same in these situations. Yet many minority folks have firsthand knowledge that this is not the case. By working hard on acting trustworthy repeatedly and on reducing racial and other kinds of profiling, officers and departments can improve trust in police. We see a shorter but equally challenging "to do list" for the community. If your neighborhood wants to decrease over-reaction and under-responsiveness on the part of police, your neighborhood association should lead the way. (If you don't have one, we have a series of pages on how to start a neighborhood association and an inexpensive e-book giving greater detail on that topic.) If you have so much disorganization that a neighborhood association is too weak or can't be sustained, at least you can and should organize a block unit that will lead the charge. Our big point is that you can't do this by yourself. If you want to bring crime under control in your neighborhood, it is absolutely critical that witnesses to crimes and suspicious behavior be willing to speak up and talk with police about what they saw and experienced. Without this, offenders go free and eventually are likely to cause trouble for someone again. You need to show police that you have an organization that will help build confidence of residents that they can trust in police to protect their identities if they provide information. If the police are acting stupid by spending time in the house next door to a criminal, then knocking on the suspect's door immediately thereafter--only a neighborhood group can be strong enough to address this behavior with them and work out a better way for people with information to pass along information without endangering themselves. Your neighborhood association can work toward providing a neutral meeting place, for example, that can afford some measure of anonymity for those who can provide intelligence. A healthy neighborhood has community meeting places, so if you don't have a good coffee shop or community center, start one. And provide a private place within that venue where police and resident conversations can happen but where a resident can feel safe because many other community people are in the building talking with each other and having a good time. The organization also needs to work diligently with residents to see that regardless of the indignities or injustices they may have suffered at the hands of police in the past, in the end it is the community members themselves who are at risk of being victims of crime. The neighborhoods need to wise up and decide that they can and will cooperate with the police to bring bad actors to justice, even if they are someone's nephew, grandson, or brother. 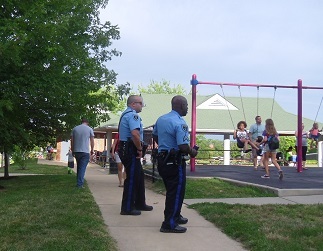 Your neighborhood association, or block unit as a last resort, can be the venue where police get to know well-meaning residents, and where those residents can begin to understand some of the struggles and challenges of being a police officer. Officers who have less than satisfactory racial attitudes usually will be turned around only through positive interactions with different races and ethnicities, not through sitting in seminars or going through sensitivity training. Especially if your city does not have a strong and well-supported program of community policing, your neighborhood association needs to fill the void. We see both neighborhood leaders and cops on the beat able to increase their mutual understanding when they focus together a few moments on the fact that some of the suspicion and alienation between the two groups has happened because of the larger framework of the criminal justice system and the legislative system. To cite just one example, the "war on drugs" was a well-intentioned executive, legislative, and judicial invention at the federal and state levels. Unfortunately it combined with racially-based discrimination in which possession and selling of drugs of choice in lower-income communities produced harsher sentences, leading to the mass incarceration problem in the U.S. today. Some of the community people automatically blame the police for this situation, when actually there are plenty of others who are complicit in too many people in jail for drug offenses. So both the community and local police departments work within damaged systems consisting of human beings. But if police and neighborhood associations or block units work together on building or rebuilding trust through honest conversations and improved practice, we think restoring trust in police is both possible and highly desirable. Big city readers will find much thought-provoking material on this topic in a Chicago report on police accountability.